When you have a reputation for turning piles of junk into.. less junky piles of things people save all sorts of things for you. This project starts out with an old chair destined for the dump. Lets start out by saying this chair was disgusting. It was covered in dust/dirt (I couldn’t even see the carved pattern on the back rest) and there might have been some creepy yellow fungus growing on it. You can see in the picture below where I started wiping the dirt off on the left side. I let it dry in the garage for a few days and then pulled it out for a paint job. I used Behr Empire Porcelain mixed with some Plaster of Paris. * Let’s just say I did a downright sloppy paint job. The final resting place for this chair is in the garden where it will get rained on, snowed on and most likely pooped on (by chickens, ducks or songbirds) so I didn’t want it to look too perfect. 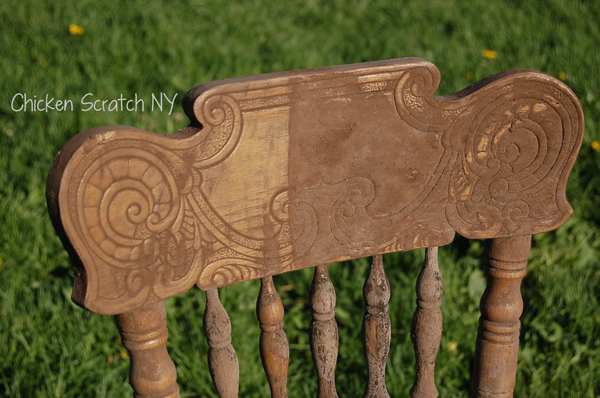 I also wanted to show off the carving on the backrest and the fancy spindles. I’m not sealing it and I’m not 100% sure the paint job will make it though the first spring shower but it will be semi-protected under the barn eaves (it’s new home will be next to the barn quilt in a soon-to-be perennial bed) so fingers crossed every one! There was an odd canned area in the center that was falling apart and I kinda ripped it out. The spot will be the perfect home for a flower pot filled with my beloved Gerber daisies and some bright green sweet potato vines. This pot is a bit higher than I wanted but it’s the only one I had on hand, hopefully when the potato vine fills in it won’t bother me so much. 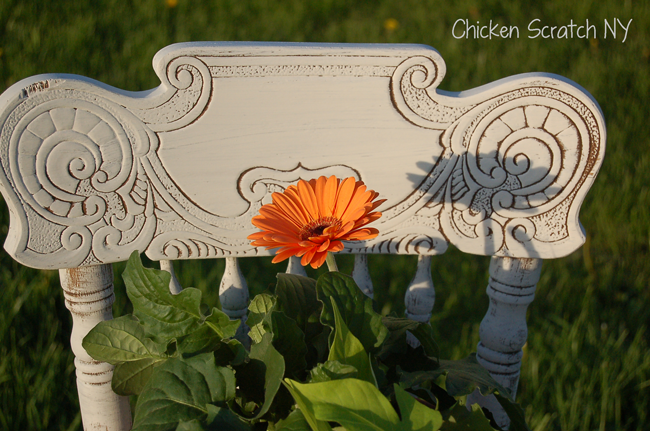 *I get a lot of questions about my chalk paint method, the truth is the fist time I used what I had (PoP and paint) and liked the results so I stuck with it. I don’t have money for the ‘good stuff’ and to be honest most of the stuff I’m painting costs less than the tiny jars of paint. I’ve seen all sorts of recipes but why fix what isn’t broke right? I’ve used DIY chalk paint for first bookcase makeover and the second DIY chalk paint cover up, when I decided the first paint job blended into the walls too much. What a charming chair for your garden. 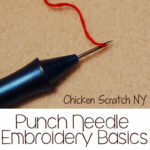 Please show where you place it when you’ve finished your barn quilt! This is my first visit to your blog and the name made me laugh. 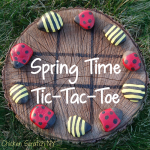 Some of my in-laws live in upstate NY and we always joke that they live in Scratch-n-Sniff, NY. It is beautiful up there though! 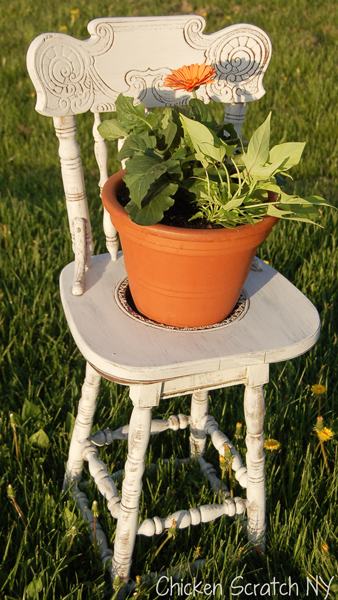 great idea for an old tattered chair. 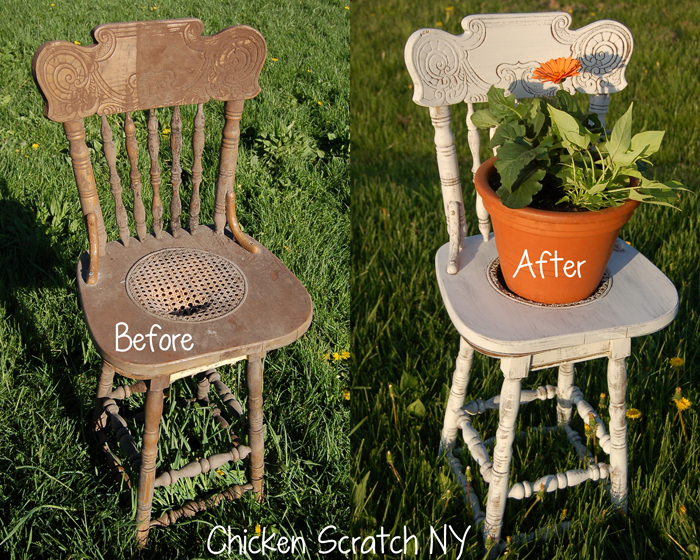 i too love to fix up old furniture and am ready to try a chalk paint recipe. I am from central ny near Syracuse, are you close by? please drop me a line when you get a chance, would love to hear from you. Such a pretty old chair. You made it look so much better and useful too! Great idea.